Scientists have identified the first three genes ever associated with the phenomenon of stuttering. All three genes are involved in the day-to-day process by which cellular components in key regions of the brain are broken down and recycled by processing in a cell structure called the lysosome. "For hundreds of years, the cause of stuttering has remained a mystery for researchers and health care professionals alike, not to mention people who stutter and their families," said Dr. James F. Battey, Jr., director of the NIH’s National Institute on Deafness and Other Communication Disorders (NIDCD), who was not directly involved in the research. "This is the first study to pinpoint specific gene mutations as the potential cause of stuttering, a disorder that affects three million Americans, and by doing so, might lead to a dramatic expansion in our options for treatment." Stuttering is a speech disorder in which a person repeats or prolongs sounds, syllables, or words, disrupting the normal flow of speech. It can severely hinder communication and a person's quality of life. Most children who stutter will outgrow the problem, although many do not; roughly 1 percent of adults stutter worldwide. Current therapies for adults who stutter have focused on such strategies as reducing anxiety, regulating breathing and rate of speech, and using electronic devices to help improve fluency. 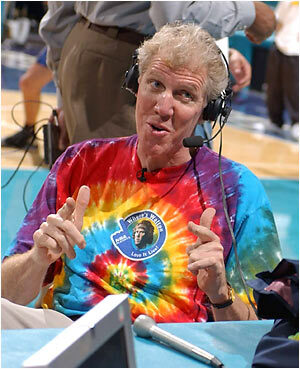 Former college and NBA basketball star Bill Walton (photo) suffered from a stuttering problem that he largely overcame and he has subsequently gone on to become a successful TV announcer. Stuttering tends to run in families, and researchers have long suspected a genetic component. Previous studies of stuttering in a group of families from Pakistan have been performed by Dr. Dennis Drayna, senior author of the new paper and a geneticist with the NIDCD, and these studies indicated that a particular region of chromosome 12 was likely to harbor a gene variant that caused this disorder. The new study by Dr. Drayna and colleagues has shown that this gene is GNPTAB. Mutations linked to stuttering were identified in GNPTAB in family studies and mutations in the related genes GNPTG and NAGPA were associated with stuttering in population studies. The GNPTAB gene codes for the alpha and beta catalytic subunits of the GNPT enzyme, which helps in lysosomal processing. The GNPTG gene codes for the gamma subunit of the GNPT enzyme. The NAGPA gene codes for a second enzyme that acts at the next step in this particular lysosomal process. Together, these two enzymes (GNPT and NAGPA) make up the signaling mechanism that cells use to steer a variety of hydrolase enzymes to the lysosome to do their work. Mutations in GNPTAB and GNPTG have previously been implicated in two serious lysosomal storage disorders [in particular, the mucolipidosis (ML) diseases II and III], while mutations in NAGPA have now, for the first time, been shown to be associated with a disorder (stuttering) in humans. In ML diseases, improperly recycled cell components accumulate in the lysosome. Large deposits of these substances ultimately cause joint, skeletal system, heart, liver, and other health problems, as well as developmental problems in the brain. They are also known to cause problems with speech. “You might ask, why don't people with the stuttering mutations have more serious complications? Why don't they have an ML disease?" Dr. Drayna asked rhetorically. "ML disorders are recessive. You need to have two copies of a defective gene in order to get the disease. Nearly all of the unrelated individuals in our study who stuttered had only one copy of the mutation. Also, with stuttering, the protein is still made, but it's not made exactly right. With ML diseases, the proteins typically aren't made at all. Still, there are a few complexities remaining to be understood, and we'd like to learn more about them." The current findings open new research avenues into possible treatments for stuttering. For example, current treatment methods for some lysosomal storage disorders involve injecting manufactured enzyme into a person's bloodstream to replace the missing enzyme. The researchers wonder if enzyme replacement therapy might be a possible method for treating some types of stuttering in the future. The current research was carried out by scientists from the NIDCD, the National Human Genome Research Institute, the University of the Punjab, and the Hollins Communications Research Institute. The work is reported in the February 11, 2010 issue of the New England Journal of Medicine.